Poor Little Brother: he really got the shaft when he inherited Big Sister's car seat: hers was bright pink. See what I mean? To be fair, most of the other gear I bought was more neutral! Inspired by Spoonflower, (and not wanting to pay upwards of $100 for a new cover that I wasn't all that excited about) I decided to make my own. Little Brother loves cars and trains (shocker!) so I searched for those and came up with this adorable fireman fabric by Ed Miller Design. Wash all of the fabric (not the interfacing) beforehand. First I took the cover off the seat and turned it over. See all of those seams? Those are all of the guides to the fabric pieces. *Note about iron-on vinyl: I had originally thought that it would make for an easier-to-keep-clean cover to have the fabric laminated. So I used the Heat N' Bond per the package directions and ironed it onto the firemen fabric pieces in the center of the seat. (The cuddle fabric was too cuddly to put vinyl on, and I left the side pieces without vinyl, so that it wold be more comfortable for my son's arms.) While the vinyl did make spills wipe off easily, after a few months it started to peel up in high traffic areas (like where the seat belt enters and exits.) So, I'm not sure if I would add the vinyl were I to do it all again. Now: I took all of the pieces (except the polka dot fabric pieces that make up the edges) and made little sandwiches: I put the interfacing on the bottom, then the batting, then the fabric on top. I pinned, then I cut out each piece using my rotary cutter. Now I sewed up each of my little sandwiches and laid them out again. Once I had all of my little sandwiches, I started sewing them together, constantly referring to the original cover for placement, and trying it on the car seat base to make sure it was all fitting. Right sides together, with 1/4" seam allowance, just like a giant puzzle. For the seat belt openings, I pinned on bias tape and sewed in place where indicated on the original cover. I only did the seat belt openings at the hip. The other slits on the back of the seat come last. At this point, I sewed the edge pieces to the main fabric. It would probably be easier to sew the elastic in first, but I wanted to have it all together to try onto the seat so I could really make sure to get the right fit. After sewing on the edge pieces, I put the whole thing on the base and pinned where the elastic casing should be. I left the edges raw, and just turned them under. Then I sewed up the channel for the elastic, leaving a 2" opening to insert the elastic. Once the new cover was fitting the way I wanted, I created all of the seat belt slots on the back of the cover. From behind, I marked lines through the seat belt openings onto the new cover. Then I cut those lines out (carefully!) and sewed the edges with a zig zag stitch. Again, I fitted the new cover into place, making sure everything lined up. Of course, the moment I finished this, I realized that Little Brother was old enough for a booster seat. 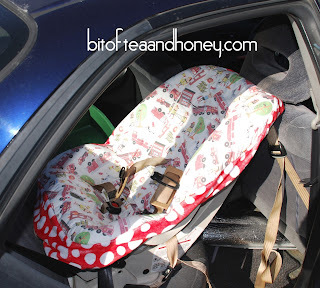 So I passed this seat and cover off to a friend - who now has a very cute and special car seat! Yay!